It's a new year for the Chinese -- the year of the Water Dragon to be precise. The Chinese consider it a great honor to be born in the year of the dragon as it means that the child will be born with strength, intelligence, good luck and lots of other desirable qualities. I already know of a couple of people who are planning to conceive a baby this year and I wish them the best of luck. I spent most of yesterday baking and cleaning up because as of today, there should be no cleaning done for a week or two so that the good luck is not "swept away". That is one of many long standing traditions in our celebration of Chinese New Year and I am perfectly fine with this one! Besides, it is a rainy and cold Monday morning and it is best spent wrapped in warm blankets on the couch or in bed. Now that I'm the US, Chinese New Year celebrations aren't what they used to be for me. While I did have reunion dinner with my family, celebrations and festivities are much more low key and muted compared to the ones I used to enjoy back home in Singapore. 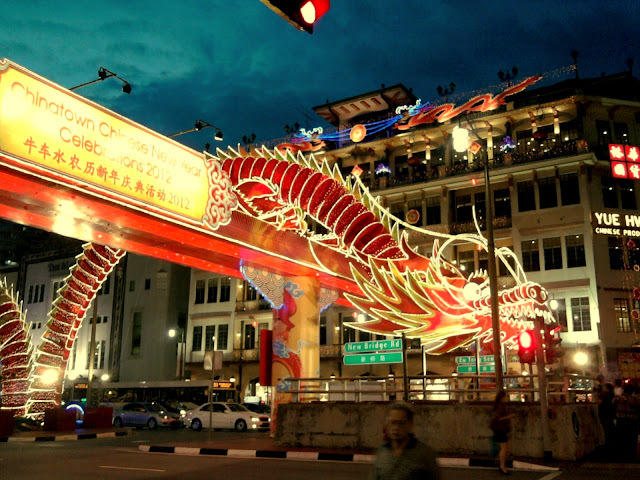 To get a glimpse of what they're like in Singapore, check out my aunt's new blog where she went on a photo walk through Singapore' Chinatown. Seeing her photos sure brought back alot of memories. Hopefully I can plan a trip back to Singapore around Chinese New Year soon! Check out my aunt's blog, Life's Little Treasures, here. 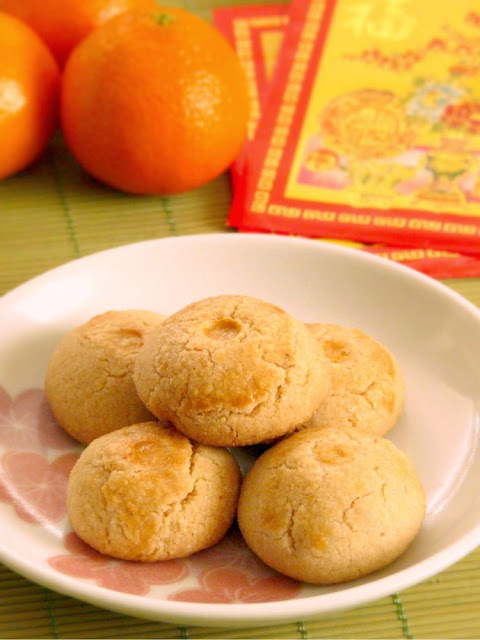 To get into the spirit of the New Year, I decided to bake a couple of my favorite CNY treats. One is the peanut cookie and the other is the pineapple tart (which I'll post later). The last time I baked these peanut cookies was back in my home economics class in secondary school (high school). Yes, ancient times you might say. ;) Having no recollection of that recipe, I looked online and chanced upon Bread Et Butter's version. It looked nice and easy so that's what I went with. She stated that this recipe uses a 2:2:1:1 ratio of flour, peanuts, sugar and fat and that as long as you stick with this ratio, you can't go wrong. How simple is that to remember? Makes about 40 cookies. Recipe adapted slightly from Bread Et Butter. You can use canned roasted peanuts but freshly roasted peanuts give more flavor so I chose to de-shell and dry roast my own peanuts. Skip step 1 and step 2 if you're using canned peanuts. 1. Start by de-shelling the peanuts. Alot of them will still have the skins intact but just by massaging the peanuts together, the skins will fall right off. Spread them out on a larger plate and pick out the skinless peanuts. Don't worry if there are a few stubborn ones that aren't willing to shed their skins. They'll just have to be eaten too. 2. Heat up a wok or large pan and dry roast them over medium heat for about 5 minutes. Stir constantly to prevent them from burning. Transfer to a dish to cool. 3. Pre-heat the oven to 350 degrees F. Add the peanuts to a food processor and pulse until coarsely ground. 4. Add the flour and salt (if using) to the peanuts and pulse a couple of times to mix. Next, slowly add the melted butter to the dry mixture while the food processor continues to run. Stop and scrape in the sides as needed. The resulting dough should be wet enough to hold a shape without crumbling. If it is too crumbly, keep adding melted butter by the tablespoon until you get the right consistency. 5. Roll the dough into uniform 2" balls. I used a teaspoon to measure a heaping scoop and that helped in keeping them all at about the same size. 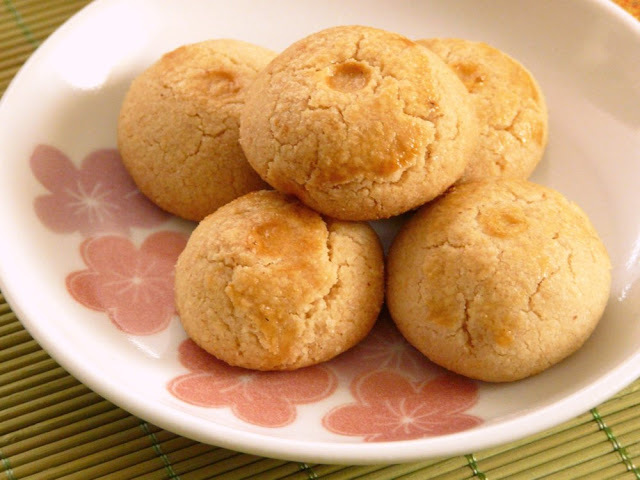 Using the wider tip of a chopstick, make a small indentation on the top of the cookie. This gives them their distinctive rounded decoration. Brush the tops of the dough with the beaten egg and bake for about 15 to 20 minutes until golden brown. Transfer them to a wire rack to cool. They turned out exactly how I like it -- crumbly, buttery and crunchy and so peanutty! Enjoy!